The Accidentals won the Harmony Sweepstakes in 1995 with their signature tune, "You Win." The eight piece group is known for their exemplary musicianship and unexpected arrangements. Though the advance copy we received for review did not include all of the songs on the CD-there will be twenty in all-what we heard lived up to our high expectations, including the hearty "Wassail Song," a pristine "I Wander As I Wander" and the CARA award-winning "Rudiana," a hilarious tour-de-force that sends up a variety of musical genres from classical to tango! NYC-based, 9-member, mixed-voice Accidentals have been personal favorites of ours since their 1995 Harmony Sweepstakes win. The group has gone through five wonderful CDS, numerous awards and some personnel changes since then (their alumni remain a cherished part of their family, and they are joined by Kevin, Todd and Stewart on this recording). The group is not going home for Christmas because New York City is their home, and the CD has a very New York flavor to it. "Winter in Manhattan" is a funny, surprising, hip Christmas song, and standards "Carol of the Bells," "Frosty the Snowman," "Have Yourself a Merry Little Christmas," "What Child is This," "Three Traditional Carols," "Balulalow," and "Silent Night" are as beautifully and brightly arranged and harmonized as we have ever heard these songs. Several excellent group originals, including the title tune by Bill Mitchell and Jim Vincent, and two winners written by Dennis Deal, the accompanied, funny, brutally honest "The Last 12 Days of the World" and "(I Honestly Hate) This Gift." A pair of lovely classical pieces by Maurice Durufle, "Tota Pulchra" and "Ubi Caritas;" and Francis Poulenc's joyous "Hodie Christmas" are icing on the yummy musical cake that is "I'm not going home for Christmas!" NYC-based, unique mixed-voice octet the Accidentals won the 1995 Harmony Sweeps Finals, winning first prize, audience favorite, and best song. "Plush" is dedicated to the group's beloved New York City, but besides Paul Simon's "Still Crazy After All These Years," most of the material is not related to NYC. Rather, it's the jazzy, sophisticated sound, thanks especially to arrangements and music by the group's Margaret Dorn, on these 21 songs that make us think of the Big Apple. Poetry is a very strong theme here: "The Earth and Man" is from a poem by Stopford Brooke, "The Mermaid" and "The Dolphin" are poems by Eleanor Wilner, and "Jazz Fantasia" and "Prayers of Steel" are poems by Carl Sandburg. "Betrothal," "3 Females" and "Lunch in the Rain" are poems by Marcia Pelletiere," and "It Ceased To Hurt Me," "Did You Ever Stand," "The Night Was Wide" and "Our Only Lullaby" are poems by Emily Dickinson. Other favorites are "Hymn," "Watercolor," Christopher Cross' "Sailing" and the accompanied "Many Voices." "Plush" is a complex, stunning, beautifully done piece of work by one of the best vocal ensembles on the planet! 1995 Harmony Sweepstakes winners present songs of exquisite arrangement including Margaret Dorn's well known "You Win" and "Wheel of Time." A Latin rhythm Rudolph the Red Nose? Yes! e. e. cummings' "In Just Spring" given a musical score at last by Jim Vincent. The Cycodrama Suite should be mentioned. It's a tribute to cult rotten-film director Ed Wood Jr. and one of the most sophisticated pieces of humor in a cappelladom. 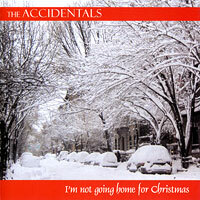 The Accidentals are a mixed chorus of 8 voices. The songs are beautifully sung, arranged, produced and totally original. They are a vocal orchestra! That's the overwhelming impression we get when listening to the Accidentals. Where other groups may be vocal bands, the voices in the Accidentals act more as if they were sections of an orchestra, each weaving a thread into the larger tapestry of song. What is even more amazing is that each of the voices can be heard clearly and individually, even on those rare moments when more than two members are creating a chorus! All in all they sing some of the most complex arrangements in all of acappelladom. Now how about the tunes? We are treated to a sense of the complexities of life itself in a new composition by Dennis Deal, "The Horizon." There are a couple musical doffs of the cap to their hometown, New York City. But wait, turn up the volume and be prepared to be blown away by a marvelous arrangement of "Eli's Comin'" which infuses a brand new spirit into a tune which was becoming a cliche. Humor...did we mention the great sense of humor. It's pretty sophisticated stuff for although there are verbal jibes at reality which are a crack-up, the music itself is a co-conspirator to making one slide from chuckles to guffaws. Try "Beatnik" for a musical joke extroadinaire in which the singer's biography goes from too cool to...no no no we won't give it away. On another tune you will discover for yourself the context of the phrase, "...pucker up sucker and kiss the world goodbye!" You'll laugh, you'll cry, it's beautiful, it's funny, you'll be beguiled by one of the best a cappella albums of the new millennium!